If there is one positive thing to come out of the tragic passing of Robin Williams, its the fact that so many people are talking about depression. There is a huge effort to help people to understand the dark insidious nature of this disease--and the fact that it is a real disease not just a feeling of melancholy that we all experience now and then. The most interesting thing that I have read in the past 36 hours or so since I heard about Robin Williams' passing is a debate that I hear in the world of diabetes all of the time--people would pay more attention to this disease if it had a different name. People think of depression as fitting things like "rain on your wedding day and a free ride when you already paid" to quote Alanis Morrisette. These are not exactly issues that lead a person to take their own life...unless they are already experiencing a much deeper pain. There is a feeling of a need to disassociate the mental illness from the emotion. In the world of diabetes, we see this same desire often. People feel that the label Type 1 diabetes does not go far enough. It doesn't show the true nature of this disease. It does not remove itself far enough away from another condition that is often associated with poor diet and the ability to be "cured" with diet and exercise. Personally I am always led back to Shakespeare when this debate is brought up. "What's in a name? that which we call a rose By any other name would smell as sweet." Okay, diabetes is not as pretty as a rose and when you can smell "sweet" when dealing with diabetes we know that you are in serious trouble but you get the point. A name means nothing. It is all about the awareness. Type 2 diabetes is not limited to people who are overweight. It is not magically cured by diet and exercise, but it is able to be managed that way unlike Type 1 diabetes. Type 1 diabetes will not be cured with insulin. Wearing an insulin pump does not mean that you don't have to think about diabetes ever again. Misconceptions. Fallacies. Misinformation. It happens with every disease. They do not need to know how to carb count but we must work to teach the general public that there is no known cure for diabetes...unless you are a mouse. An insulin pump does not mean that you have diabetes "really bad" and it does not cure your diabetes. It is a management tool that requires work and fine-tuning but is preferable by many to help maintain better blood glucose levels. Myths must be debunked to create better understanding and support. Much of the same can be said for depression. 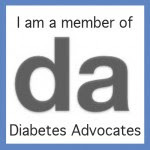 It is important that the stigma be removed--just as the stigma of diabetes needs to be gone. No one "caused" either condition. Both require medical attention and serious work to be able to manage. Ironically depression is twice as common in people living with diabetes as it is in the general population and if you have depression but don't currently have diabetes, don't worry because people living with clinical depression are more likely to develop type 2 diabetes! The Mayo Clinic feels so strongly in this that their website specifically cautions people living with diabetes to be very alert to signs of depression. If you feel that you are suffering from clinical depression, please see your doctor. Just as you take insulin to deal with the imbalance in your body thanks to a non-functioning pancreas, it is important to take medication that can help to work with brain chemistry that has somehow found itself out of balance as well. Counseling, therapy, and even life coaching can help to deal with the daily stressors of diabetes care. They can help you to deal with triggers and create coping strategies but they will not fix the chemistry if you suffer from clinical depression. If you are struggling with a diabetes diagnosis, please look for support from others. If you feel that the depression and sadness has become prolonged or overwhelming, please see your doctor. Together you can create a plan to help you find your way forward again. Earlier this summer, I received an email from a young lady who was embarking on an adventure that looked really interesting. I meant to take a much closer look sooner but the email came in while I was away and then managed to get lost in my inbox. Today I decided to seek it out again and see what she was up to. The young lady’s name is Haley Maurice. She is now 15 and was diagnosed with Type 1 diabetes at the age of 7. Her plan for this summer was adventurous for any teen but even more exceptional when you remember that she is living with type 1 diabetes. “On July 16th, my brother Ethan and I will be backpacking 221 miles from Yosemite National Park to the top of the highest peak in the continental United States, Mt. Whitney, to raise funds for JDRF. A few days ago, I hiked a 1.7km trail that has a 500 ft decent. That was enough of a challenge for me. I can’t begin to imagine 221 miles and 46,000 feet with blood glucose testing, site changes, insulin adjustments, treating lows, and carrying food and shelter. I further was not sure how I would feel if it was my child with diabetes doing this. Silly, of course I know how I would feel. I would be nervous and proud. I would be terrified of all that could go wrong but would trust in the other sibling to help out in emergencies. I would be proud that my child would take on such an amazing adventure for a good cause. I am guessing that Haley and Ethan’s parents probably felt much the same way. “We made it!!! 221 miles of hiking from Yosemite to Mount Whitney! What an amazing feat! I am so impressed by these young people. I am impressed by their courage, dedication and stamina. When Haley contacted me, she was asking for only one thing, for me to share her story and that is what I hope to do here. Please look at their video, check out their website and the amazing pictures of their adventure. If you can, also contribute to their goal of raising $1000 for every one mile that they hiked this summer. For the past year or so we have been hearing clips about the Bionic Pancreas Project. I was lucky enough to have heard Dr. Ed Damiano present about his work at the CWD Friends for Life Conference in Toronto. It was the first time that I was truly excited by what was happening in diabetes research. This was a project that was privately funded and motivated by a father’s love. There was no political agenda to hold things up. There was only his passion and desire to see his son safe when he could no longer be there to watch him at night. His drive pulled at my heart and for the first time gave me hope. This summer, clinical trials are continuing. More adults are getting to experience life with the bionic pancreas. More children are getting to experience it as well. According to the latest video, they are now reaching the stage to change the design making things more streamline. This is moving quickly to become a reality! Being me, and spending so many years advocating for access to better treatments regardless of income or insurance coverage, I can’t help but wonder what direction this project will take. To me, and I am sure to Dr. Damiano, this device is the diabetes equivalent of a pacemaker and should come under the larger umbrella of our health care system making it available to everyone who is insulin dependent. At this stage, they are far from knowing how things will proceed in terms of distribution. We will have to wait. While we wait, I will continue to work to see access to insulin pumps and CGMs for all people with diabetes regardless of age. I will continue to put money into my son’s RDSP just in case he does have to purchase the system out-of-pocket to begin with. If need be, we will advocate for access for everyone to this life changing technology but for now, I will watch and cheer from the sidelines. I will hope that this will be the technology that changes the life of my son and all of our children with diabetes (no matter what their age). I am not exactly sure what made me decide to open this book and read it. Perhaps it is my own struggle with my body image. Perhaps it was the fact that is was a mother telling a story of her struggle with her child's potentially lethal disease. Whatever it was, this book quickly showed me that being a parent of a child with a disease--any disease, sadly puts you in a club with more similarities than differences. Brave Girl Eating by Harriet Brown, first hit home when she wrote "you're not to blame, you're not alone, and you can make a difference in your child's life". What a powerful statement! It needs to be a poster in our diabetes clinics. It is a statement that each and every parent of a child with diabetes needs to fully understand and embrace. As I have said before, we carry our own guilt and are further burdened by the misconceptions of others. We need to know that we are doing our very best and that is all that any one can ask. She talks about feeling overwhelmed by her daughter's illness and then feeling guilty about it. "I can take a walk, read a book, shut out the anorexia for a little while. But its insider her. She can't get away, not for a second." How many parents of children with diabetes have felt that exact same way? How often have we felt guilty because we could sleep through the night when our child went away to camp or when we went on vacation and left them with a responsible parent or loved one? It hurts us to know that we can leave it behind but our children can't. She talks about things like her daughter lying to her about food and again the issue crosses over easily into life with diabetes. In our case, our children tend to reach an age where they lie about food intake, insulin dosing, or bg level readings. The violation of our trust is devastating either way and in both cases the lie is brought about by frustrations with a disease. It isn't any better no matter where it comes from. The pain and sadness as a parent is equally overwhelming. Ms. Brown talks about wondering if her daughter's behavior is because of anorexia or simply because she is a teen? When my son was small and would fall asleep during the day, I would panic and test him. Was he sleeping because he was a toddler who was tired or was he low and had passed out? If he threw a tantrum, was he being a child full of spite and temper or was his rage fueled by high blood glucose and therefore he may not completely responsible for his actions? How did I decide? How did I find a balance with punishment? Like the author, I struggled. In Brave Girl Eating, the author also talks about stigma. In this case the stigma of a mental illness. In diabetes, we know that there are many stigmas and fighting the public's misconceptions can often be almost as difficult as battling bg levels. To make things even worse, there are an increased number of people living with diabetes who also are dealing with eating disorders (is it any wonder when their lives revolve around food 24/7) as well as depression. They must understand this book in more ways than I can begin to imagine. How painful. Ms. Brown also speaks to the idea that anorexia has taught her to live in the moment. Ironically diabetes has had a similar effect on my own life. Learning to live life four hours at a time was the only way for me to cope. Nothing else mattered. Tomorrow was too far away but his NovoRapid would kick in within four hours and it could fix that high, maintain his perfect reading or be just enough to send him low and create more havoc for me. Four hours--just get through four hours and then go forward. As I mentioned, ironically she notes the similarity to diabetes more than once. In learning to live with the new normal of life with anorexia, she wrote, "I told her if she had diabetes, she'd have to test her blood sugar every day; at first it would be a pain, but she'd get used to it. It would become just one of those things she had to do, like brushing her teeth. It would become part of "normal" for her." We know that diabetes is a bit more than testing daily. We know that you never really get used to lancing your finger each day, but it is something that has to be done...like brushing your teeth. It is something that you somehow have to come to accept in order to move forward with your life. As I started to read Ginger Vieira’s book Diabetes Burnout, I was hit by an incredible sense of guilt. Did I push my son too hard? Did I expect too much? I was later vindicated but I was reminded the overwhelming guilt that comes with being a parent of a child with diabetes…or maybe its just me. Well meaning people share with us many “reasons” that children develop diabetes and somewhere in the back of our mind’s ( well my mind anyway) we ask was that it? Was that why my son developed this disease? Did I not breast feed my son long enough? Did I feed him cow’s milk too soon? Was vaccinating on schedule a bad thing? Was there a family history that we missed? I know that I didn’t feed him too much junk. I know that it wasn’t two years of chocolate bars that did this to him but maybe that first time that he seemed off months before I should have realized that he was seriously ill and that it wasn’t just the flu? Eventually I realized that I couldn’t spend all of my energy feeling guilty about the “what ifs”. Diabetes took up enough of my energy on its own…but that led me to a new source of guilt. Had I denied my other son because diabetes took so much of my energy? My older son never complained but it was a question that popped into my head now and again. We went to diabetes related events and he met many new friends. He always seemed to have more fun than my child with diabetes. I was there for my oldest son in his events and activities. He knew that when there was an issue that required someone to stand beside him, I always did. I was also there for the softball games, school events, report card days, sick days, and driving school. I was pretty sure that I had successfully found a balance. But what about a balance with diabetes and my youngest son? Did it take over everything? Did he hate me because I punished him for diabetes related offenses? Did he feel that I had robbed him of his childhood by focusing on testing and injecting when he wanted to play and forget it all? My children seem to be well-adjusted. We have memories of family vacations and times spent with each other. We communicate regularly. I guess I didn’t scar them too badly–I hope.I didn’t have to feel guilty about robbing my children of their childhoods. Diabetes changed things but it didn’t destroy it. One other area of guilt seems to always flutter on the sidelines. I know I am not alone in with this one. I have heard other parents mention it. Its the guilt that comes when our children go away and take diabetes with them. It’s that time when they go to the other parent’s house, spend the night with a friend or with grandparents. It’s that time when they go to camp for a week or move away from home. It is then that a new guilt moves in. I no longer have to think about diabetes 24/7. Oh I still wake at night. I still look at a meal and automatically count the carbs and dose insulin in my head. I wonder what my child’s blood glucose level is at any given time. I worry and wonder if he is taking proper care of himself, but I have a break. I don’t really have to be awake at night. I can enjoy that extra glass of wine without fear of dealing with a low later that evening. I don’t have to remember to test after that walk. I have it easy. It’s not fair. The guilt becomes stifling. As a parent, I want to carry the burden of this disease for my son but I can’t. I want to give him a break but I can’t even if I get one! It doesn’t seem right. I must be a terrible parent…but maybe I am not. When my son is with me, I help him with care when he wants. When he has an issue and he is away from me, he calls and asks for help. We talk about readings…when he is ready. We talk about other things as well. I work hard to make diabetes the last thing I ask him about not the first. Guilt doesn’t get me anywhere. It’s a backwards looking emotion. Life didn’t come with a guidebook. My children were not born with a manual attached. I do my best. We all do. Guilt must be released not harbored…and I do. I have made mistakes but my kids are okay. They are strong. They are relatively healthy. They are smart. They do me proud. Why waste energy with guilt? Move forward and smile. It’s the only way to go. Gifts like this make me realize that all is very well indeed.